Wow. I think we are truly in a Golden Age of superhero cinema, wherein technology and talent and investment have converged to create engaging spectacles that not only sell a sh*t-ton of action figures but, y’know, have something to say. Wonder Woman. Logan. Captain America: Winter Soldier. Spider-Man: Homecoming. Thor: Ragnarok. Deadpool. And, now, arguably the best of them all: Marvel’s/Disney’s Black Panther. Classic comic book creators like Jack Kirby, Stan Lee, Neil Gaiman, Alan Moore long ago tapped into the allegorical power of superheroes as a lens to assess our present reality and to give us hope … or a dose of hard medicine. It took Tinseltown decades – with a number of promising starts and soul-crushing stops – to wake up to the fact that, while, yes, these movies cost a lot of money, they will make a lot more if they aren’t dumbed down and focus-grouped past all recognition. Give us relatable figures in a heightened environment, thereby offering commentary and guidance on surviving this tumultuous human condition. Think Shakespeare … with capes … and slightly easier to follow. Or Aesop’s Fables … in Spandex. The messages in these films are essential and timely and healing, but, even more importantly (and perhaps sadly so), these messages are making money, which is, alas, the only language that sometimes brings actual change in this country. Nonetheless, I’ll take it. Black Panther is a superhero fable our stormy times need. If Wonder Woman helped soothe hearts broken over Hillary Clinton’s defeat – anticipating the #MeToo and #TimesUp movement – in an escapist adventure celebrating the strength and power of women, Black Panther offers a fist-raising rallying cry for those in pain over the institutional racism and politicized xenophobia which always existed but has come roaring to the fore since November 2016. Imagine an African nation, with limitless natural resources, that developed, unmolested by Western colonization, to its truest societal, cultural, intellectual, industrial, and technological potential. This is Wakanda, the fictional setting of the latest offering from Marvel Studios. Directed with verve and sensitivity by Ryan Coogler (Fruitvale Station, Creed) from his own screenplay, Black Panther takes a smidge of Hamlet, a bit of Richard III, maybe some Henry IV, a lot of Alex Haley, some Suzan-Lori Parks and James Baldwin, with a sprinkling of Disney’s own The Lion King and throws it all in a blender, yielding magic. Prince T’Challa (a haunted and haunting Chadwick Boseman with enough leonine presence to command the screen and enough emotional uncertainty to allow us all to project our own anxieties and dreams onto him) returns to a kingdom in turmoil after the assassination of his father. His mother Queen Ramonda (Angela Bassett who really just has to be Angela Bassett here … her and her cheekbones … and that’s just fine) is preparing for her son’s coronation. T’Challa’s sister and Wakanda’s tech wizard Shuri (a gleefully scene-stealing Letitia Wright) impishly ensures her brother’s swaggering male ego doesn’t run off the rails. T’Challa is challenged for the throne, first by competing tribal leader M’Baku (an imposing yet delightfully comic turn by Winston Duke) and later by interloping American Erik “Killmonger” Stevens (a beautifully nuanced Michael B. Jordan). I won’t spoil some fairly significant “palace intrigue” twists, but suffice it say Jordan delivers one of Marvel’s strongest villains to date (watch out Cate Blanchett’s “Hela” and Ian McKellen’s/Michael Fassbender’s “Magneto“). This isn’t your standard-issue “I’m going to take over the WORLD” baddie. Nope, Killmonger is a disruptive demogogue whose power-to-the-people shtick is motivated by anger and frustration that Wakandan isolationism has deprived generations of displaced African descendants the resources and aid that would have transformed their lives and leveled the playing field. Who’s the villain, and who’s the hero here? Pretty heady stuff for a superhero fantasy, and Jordan doesn’t miss a beat. Coogler wisely frames the film with sequences set in Oakland, California, depicting the hardscrabble conditions facing too many African-Americans today. (People vs. OJ Simpson’s Sterling K. Brown puts in a brief but effective, narratively significant appearance here.) The juxtaposition of our reality with the “Emerald City”-escapist beauty of Wakanda is sobering and revelatory. We also have damn fine character turns by Danai Gurira as Okoye, the chrome-domed head of Wakanda’s all-female army Dora Milaje, and by Lupita Nyong’o as Nakia, first and foremost Wakanda’s chief foreign intelligence agent and only secondarily T’Challa’s on-again-off-again love interest. The women are anything but damsels-in-distress in this flick; they are a**-kicking-take-names-later warriors who more than hold their own onscreen with our titular hero. Martin Freeman is a twitchy, breezy delight as government handler Everett K. Ross, and Andy Serkis is great, scenery-chewing fun as sonically-super-powered smuggler Ulysses Klaue. Even Forest Whitaker as Wakandan elder Zuri with the same old tired, hammy, pontificating performance which he always delivers can’t bring this intoxicating wild ride to a screeching halt. It’s a Marvel movie, so, yes, there are spaceships and car chases and explosions aplenty, nail-biting races-against-the-clock, and more references to fictitious ore “Vibranium” than you could shake a graphic novel at. The design-work in this film is beyond extraordinary, importing Jack Kirby’s original comic book concepts but infusing them with an African authenticity and a breath-taking, jewel-toned aesthetic. But Coogler knows that none of that matters a damn if we aren’t invested in character, plot, and message. This is a remarkable film. It’s time for change. For women. For people of color. For the LGBTQ community. For those of us growing older. For the differently-abled. For humanity. Between seeing this film this weekend, and watching those beautiful and brave teenagers from Parkland, Florida, publicly calling out the complacency, corruption, and culpability in our national leaders, I – for the first time in a while – have (a glimmer of) hope. Thank you to sweet friend Victoria Nampiima, an upcoming Ugandan fashion designer, for sending these beautiful threads this week! Marvel Studios’ latest – Thor: Ragnarok – is about as delightful a film to come from the Marvel/Disney machine as we’ve yet seen. Marrying the free-wheeling whimsy of Ant-Man with the trippy nothing-is-too-zany visual style of Dr. Strange, layering in the heart and humanity of the Captain America films, and playing off the wackadoodle Shakespearean promise of Kenneth Branagh’s first Thor, director Taika Waititi (Hunt for the Wilderpeople) nonetheless delivers a completely unique vision and a superhero flick for the ages. There is nary a shred of evidence of the micromanaged focus-grouping that seems to have plagued other entries in Marvel’s now 17-movie strong cinematic universe: the unfunny, overbaked narrative mush of Guardians of the Galaxy Vol 2; the ponderous “how-many-action-figures-can-we-cram-into-this-for-merchandising” clutter of Avengers: Age of Ultron; the just plain dull-as-dishwater “end-is-nigh” pretense of, yes, Thor: The Dark World. No, Thor: Ragnarok belies its title with a light-as-air zip and a screwball comic touch that plays beautifully to star Chris Hemsworth’s Cary-Grant-trapped-in-Tab-Hunter’s-body charms. Hemsworth’s gift is in simultaneously embracing the absurd and the self-serious, mining Thor’s lovable arrogance in uncertain circumstances for “fish-out-of-water” laughs. Akin to Shakespeare’s better “history” plays (say, Henry IV with its introduction of the iconic Falstaff), Ragnarok honors the operatic complexity of its source Norse mythology by juxtaposing the light and the dark, the goofy and the grand, to play out the prodigal son’s/hero’s quest to overcome both palace intrigue and the intoxicating lure of interstellar adventure to find his proper path to the throne. The plot is almost impossible to encapsulate, but I’ll try. Thor and brother Loki (Tom Hiddleston reclaiming the smarmy twinkle that made the character such fun initially) are on a search to find their father Odin who is hiding out in Norway. Early on, they encounter Benedict Cumberbatch’s Dr. Strange in a witty cat-and-mouse sequence that telegraphs that Ragnarok won’t be your typical Marvel flick. Lo and behold, Thor’s old buddy The Hulk (Mark Ruffalo fully embracing the sweet/sour rampaging baby characterization from the Avengers films) is somehow on Sakaar too. The boys fight; they make up; they fight again; and eventually, with the aid of new compatriot Valkyrie (Tessa Thompson bringing the boozy, bossy fun), return to Asgard and save the day (more or less) from Hela’s machinations. Whew. Oh, and Karl Urban (Star Trek, Dredd, Pete’s Dragon) pops up as Hela’s right-hand thug Skurge the Executioner, and, as always, Urban brings a nuanced inner-conflict and a compelling screen presence to a character who in lesser hands would have been a screaming, raving slab of testosterone. One day, I’d like to see him in a movie that doesn’t require special effects, if they make those any more. In the end, though, the film is a showcase for Hemsworth’s effervescent wit and steroidal comedy and for Waititi’s sure-handed cinematic voice and eye-popping visuals. Hemsworth is at a difficult career crossroads: a household name actor in international box office blockbusters who doesn’t yet seem like a star. Perhaps this turn will change that. If not, he and Waititi need to team up again posthaste and, maybe this time, sans capes. Hemsworth is that rare performer – a beautiful human specimen with the comic genius of an ugly duckling. Waititi is that rare director – one who loves all films and has an encyclopedic knowledge of the best and the worst but deftly avoids self-indulgence and derivativeness. As Goldblum’s Grandmaster says in response to Thor’s use of his lightning powers, “Out of your fingers … was that, like, sparkles?” Indeed, Hemsworth plus Waititi generate nothing but cinematic sparkles. Here’s hoping for more. A week or so ago, I shared this wonderful coverage from my hometown and from The Legal News of an upcoming speaking engagement at the Legal Marketing Association’s national conference. 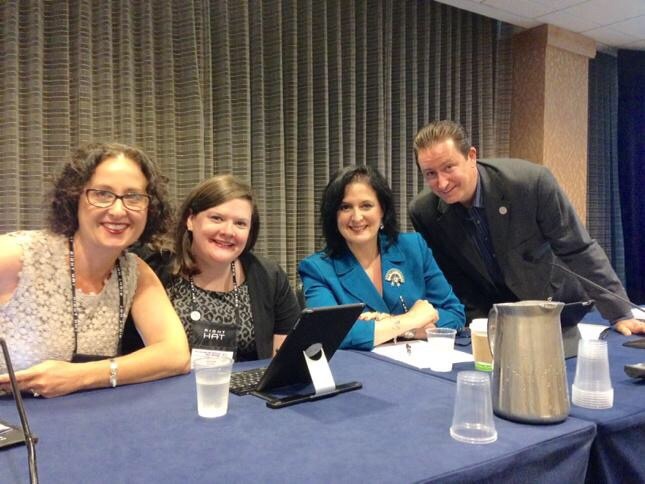 LexBlog posted this summary (here) of our presentation “Collaboration and coexistence among barristers and ‘baristas'” – including tweets from audience members (and panelists) summarizing key points. 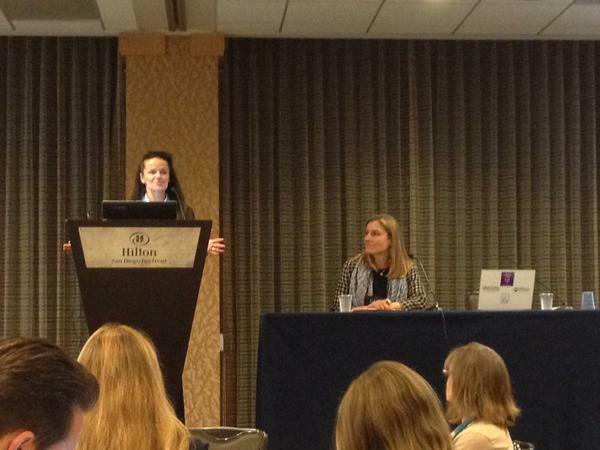 Gina added “10 post-event tips to get the most out of conference attendance” here at her marvelous The PR Lawyer blog. Heather offered a more existential take in “The spirit and energy that connects us all” at her fabulous Legal Watercooler here. 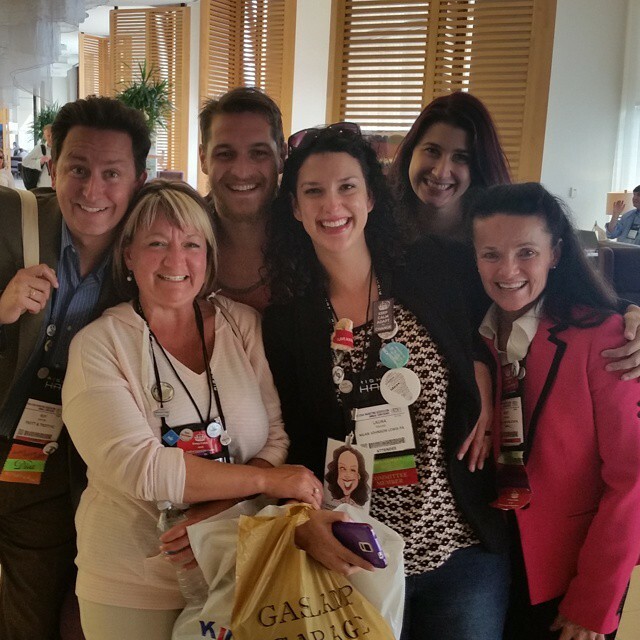 Just for fun, click here for Lindsay Griffiths‘ media montage of the great #lma15selfie experiment! Lindsay (International Lawyers Network) also wrote an excellent piece regarding the LMA General Counsel panel here at her blog Zen & the Art of Legal Marketing. 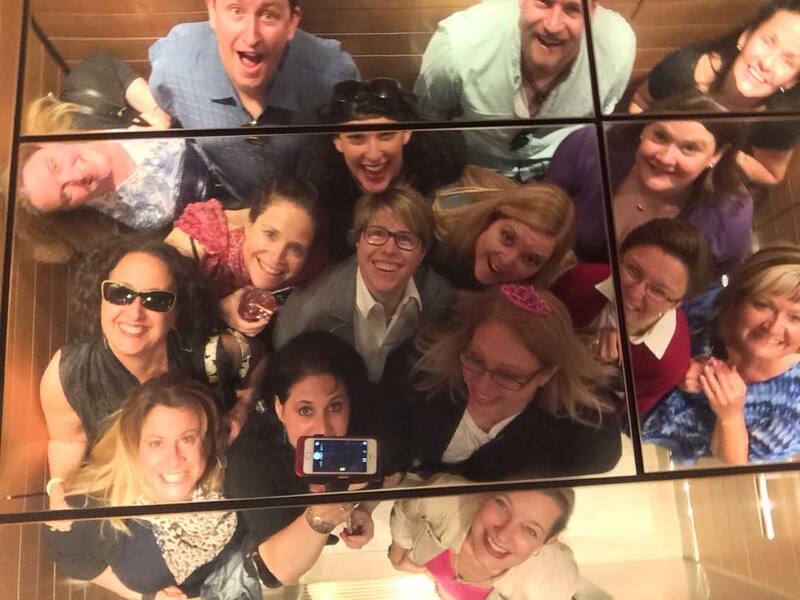 How many marketers fit in an elevator? I know this is a strange collection of content for my blog that usually focuses on movies and culture and rampant silliness, but I thought you might enjoy seeing a glimpse into my daily life. Many of you readers are social media mavens so this information may be helpful in a variety of ways. Finally, what follows is a piece I wrote for LMA about another conference panel “Control your online reputation and image,” presented by the talented duo of Nancy Myrland (Myrland Marketing) and Amy Deschodt (Weil). (Nancy’s blog the Myrland Marketing Minute can be found here.) Enjoy! 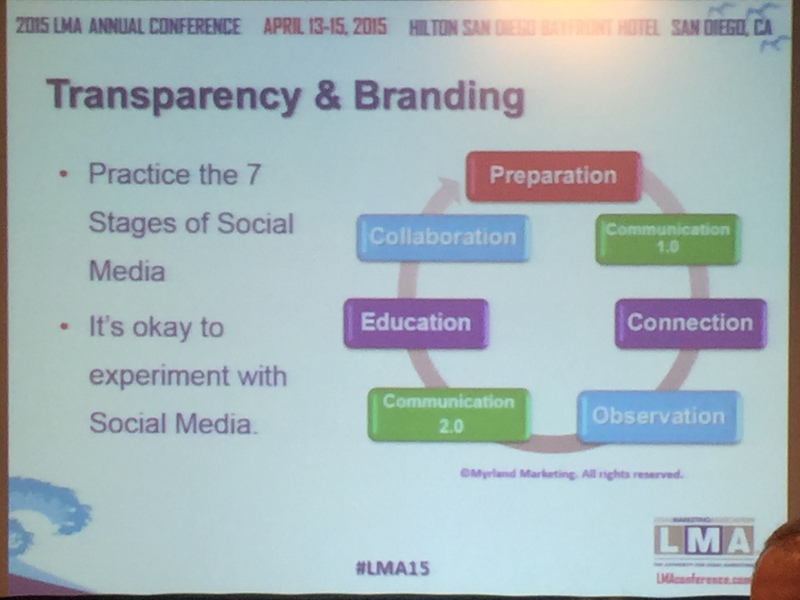 At the 2015 LMA conference in San Diego, social media and public relations experts Nancy Myrland (Myrland Marketing & Social Media) and Amy Deschodt (Weil) confirmed this assertion but with a healthy dose of postmodern digital age caution. Their session, titled “Control Your Online Reputation and Image,” offered attendees a strategic and tactical overview of how to navigate choppy PR waters in an era where Twitter, Facebook, YouTube, Tumblr, blogs, and other platforms can escalate media crises in a matter of minutes and seconds, not days and hours. First and foremost, the panelists noted that if you don’t plan to initiate communication then you shouldn’t build social media into your communications strategies. Social media is at its most effective when it is used conversationally. To simply broadcast messages defeats its inherent power. Responding to and shaping commentary is key. Social media is dialogue. Understanding this core assumption is vital to understanding how to respond in a crisis, let alone day-to-day brand management. According to Myrland and Deschodt, we live in a world that is increasingly accustomed to using, say, Twitter as an instantaneous means of offering complaint (or kudo). Legal marketers, they say, disregard this cultural shift at their own peril. Whether in the digital realm or not, a media dust-up can erupt at any point. Some in the audience were agnostic that a law firm would be faced with the same vitriol that say a restaurant chain or bank might face. Myrland was quick to point out that, whether via association with a client or due to the nature of a particular firm’s work, a firm could find itself with a PR target on its collective back. Deschodt added that when responding to a crisis be swift with thought, listen, and be factual. Never delete comments – the world is watching, and open and transparent dialogue is essential. Myrland and Deschodt highly recommended hiring a seasoned social media manager who knows the ropes and that consulting the Bar on thorny issues is always advised. Build up a store of social capital (e.g. posts that add value, acknowledging and responding to commenters) before you “spend” it either for promotion or in a difficult situation, and follow your state’s social media ethical restrictions. Also, there are a great number of tools out there for tracking, monitoring, and automation (e.g. HootSuite, Buffer, and the like). The ability to monitor by key search terms (e.g. hashtag trending) is a huge advantage offered by something like HootSuite, both in monitoring the everyday impact of your branding efforts as well as chatter in the midst of a crisis. Automation can be invaluable as well, but don’t let it detract from the need for interaction. Auto-posting content can quickly veer into blasting not conversing, so be mindful of that pitfall. 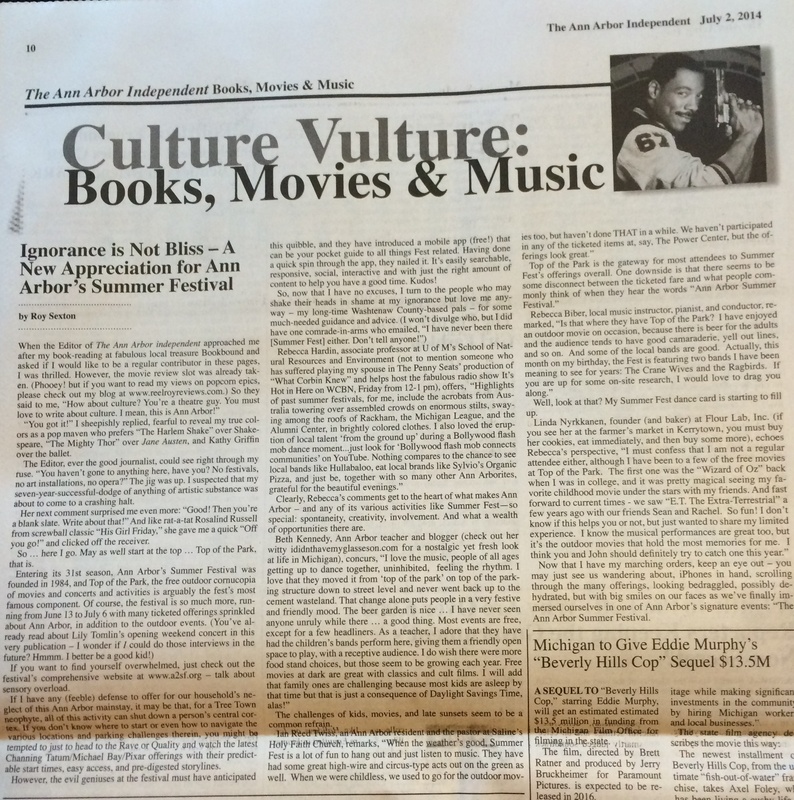 When Pat and Marjorie Lesko approached me after my recent book-reading at fabulous local treasure Bookbound and asked if I would like to be a regular contributor in their pages, I was thrilled. “You got it!” I sheepishly replied, fearful to reveal my true colors as a pop maven who prefers “The Harlem Shake” over Shakespeare, The Mighty Thor over Jane Austen, and Kathy Griffin over the ballet. Pat, ever the good journalist, could see right through my ruse. “You haven’t gone to anything here, have you? No festivals, no art installations, no opera?” The jig was up. I suspected that my seven-year-successful-dodge of anything of artistic substance was about to come to a crashing halt. Her next comment surprised me even more: “Good! Then you’re a blank slate. Write about that!” And like rat-a-tat Rosalind Russell from screwball classic His Girl Friday, she gave me a quick “Off you go!” and clicked off the receiver. So … here I go. May as well start at the top … Top of the Park, that is. If you want to find yourself overwhelmed, just check out the festival’s comprehensive website at www.a2sf.org – talk about sensory overload. If I have any (feeble) defense to offer for our household’s neglect of this Ann Arbor mainstay, it may be that, for a Tree Town neophyte, all of this activity can shut down a person’s central cortex. If you don’t know where to start or even how to navigate the various locations and parking challenges therein, you might be tempted to just to head to the Rave or Quality and watch the latest Channing Tatum/Michael Bay/Pixar offerings with their predictable start times, easy access, and pre-digested storylines. However, the evil geniuses at the festival must have anticipated this quibble, and they have introduced a mobile app (free!) that can be your pocket guide to all things Fest related. Having done a quick spin through the app, they nailed it. It’s easily searchable, responsive, social, interactive and with just the right amount of content to help you have a good time. Kudos! Clearly, Rebecca’s comments get to the heart of what makes Ann Arbor – and any of its various activities like Summer Fest – so special: spontaneity, creativity, involvement. And what a wealth of opportunities there are. The challenges of kids, movies, and late sunsets seem to be a common refrain. Well, look at that? My Summer Fest dance card is starting to fill up. Now that I have my marching orders, keep an eye out – you may just see us wandering about, iPhones in hand, scrolling through the many offerings, looking bedraggled, possibly dehydrated, but with big smiles on our faces as we’ve finally immersed ourselves in one of Ann Arbor’s signature events: “The Ann Arbor Summer Festival’s mission is to present a world-class celebration of arts and entertainment that enriches the cultural, economic, and social vitality of the region.” Well, all right – sounds good to me! See you next fall, Channing Tatum! 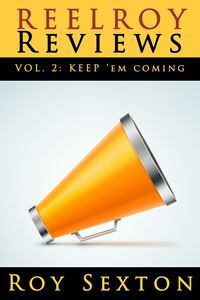 12 days left until the official launch of ReelRoyReviews, a book of film, music, and theatre reviews, by Roy Sexton! Yeah, I wanted to see The Butler. I still want to see The Butler. Tonight, I did not see The Butler. Nope, instead, I saw The Mortal Instruments: City of Bones. Yup, you read that sentence correctly. Any film that has that many cryptically ominous words AND a colon in the title is truly as bad as it sounds. At least we still have truth in some advertising, regardless how inadvertent. Cold comfort. When will this turgid phase of young “adult” fiction-turned-cinematic tripe finally pass like the hastily consumed, calorically empty fast food dinner it is? (I apologize for the colorful, though apt, metaphor.) Whom do I get blame for these movies? Harry Potter? Edward and Bella? Dawson’s Creek? Oy. After the movie, my friends and I spoke at length about movies and tv shows that move us to tears (in a good way). The chat had nothing to do with this film, but we had it nonetheless. You want to know what made me cry about this film … other than the colossal waste of production time and money it represented? I’ll tell you what made me cry…that THIS is the way Hollywood chooses to use the brilliant Jared Harris as he moons around like an angsty, tattooed version of his father Richard’s last role Dumbledore (which also was kind of a crime against humanity and art, but not as bad as this). CCH Pounder, also a terrific actor, is relegated to Viola Davis’ mystic sci-fi blockbuster cast-offs as some spooky voodoo witch landlord who, at the film’s midpoint, turns into a strange hybrid of Lord of the Rings’ Golem and Whoopi Goldberg’s character from Ghost. Oh, and our hero? The darling Lily Collins, so charming in the underrated though clunky Mirror Mirror, borrows heavily from the Kristen Stewart balsa wood school of acting while bringing a smidge of Annette Funicello’s furrowed brow and Kate Beckinsale’s leather/lycra-wearing-demon-slaying contortions. What the h*ll? This movie is a mess. I don’t think it would even make it through pilot season on The CW. And they’ll put anything on the air. The plot? What plot. Something about a girl born with some sort of magical powers to kill werewolves or vampires or demons while befriending angels and lurking about spooky old museum/castle locations in what appeared to be the Manhattan of 1984’s Ghostbusters. Oh, and poor Jonathan Rhys Meyers, Lena Headey, and Jamie Campbell Bower show up to collect a paycheck and act out some portentous nonsensical mystical hoo-ha. Yup, could have been watching The Butler. Instead, saw a movie with bad CGI, worse dialogue, and a colon in the title. Here’s hoping when I finally see The Butler, Jane Fonda and Oprah don’t suddenly turn into mopey vampire-slayers. These two veterans give Man of Steel, the latest big screen Superman treatment, much-needed heart, warmth, and vitality. Now, that’s not to say Man of Steel is bad. Quite the opposite in fact. The film is stocked with a phenomenal cast of Oscar-nominated/winning actors: the aforementioned duo playing Ma and Pa Kent as well as Amy Adams as Lois Lane, Laurence Fishburne as Perry White, Michael Shannon as General Zod, and Russell Crowe as Jor-El. All of them bring an almost BBC-level Shakespearean gravitas to the four-color (albeit grittily muted) proceedings. My biggest issue with the film would be its chronic video-game aesthetic that starts to grind the viewer into paste as pop-eyed, scowling, yet compelling Shannon’s Zod fights … and fights … and fights … and fights with Cavill’s Superman, pretty much turning Metropolis into a smoking crater. The sheer improbability of all the destruction waged hurts the otherwise credible dynamic established by this great cast. But back to Lane and Costner. With very little screen time, they made a believer out of this viewer … that the all-American values these adoptive parents impart in their son aren’t some goody goody impulse. Rather, these values are a tool the couple use to keep their child safe, helping him blend into a small-town/small-minded world that would otherwise loathe him for his exceptional talents. A fresh and interesting lens through which to view an oft-told American myth. If last summer’s Dark Knight Rises, which was directed by Man of Steel producer Christopher Nolan, was a parable of 99 per centers run amuck, then this follow-up plays on today’s crazed paranoia – among neo-cons and bleeding hearts alike – of an imminent fascist state controlling all thought, action, and deed. Crowe’s Jor-El rockets his baby boy to Earth to show his Kryptonian people a different way, a life of free-will, hope, and joy. Problem with that is that we Americans can be a cowardly and fearful lot … so thank goodness little Kal-El (soon to be Clark Kent) stumbles upon a prototypical humanist couple in a Kansas cornfield. And you know the moment that brought me to tears? (SPOILER ALERT!) When the filmmakers have Pa Kent meet his maker going back and rescuing the family pooch from a CGI-swirly tornado barreling down a stretch of Kansas interstate. Yes, the dog survives, and Costner gets his glow-y Field of Dreams moment right before getting swallowed by the twister. He looks knowingly at his space alien boy as if to say, “Be humble, do the right thing, and always help all creatures great and small.” And inadvertently, it was also a moment of a former blockbuster boy of summer (Costner) passing the torch onto a new one (Cavill). A satisfying conclusion to Christopher Nolan’s powerful, earnest, at times too self-important take on the Batman mythos, the final film in his trilogy “Dark Knight Rises” is a somber summer epic. Will the movie find its way past the tragic circumstances surrounding its debut? Almost impossible to predict. But there is something strange that happens watching this film in light of that context: what was intended, no doubt, as an allegorical take on post-9/11 America with our nation’s rampant paranoia and wildly divisive political machinations, now becomes a rumination on violence begetting violence. All the returning players bring an almost-PBS-miniseries gravitas to the proceedings – Oscar nominees/winners all, Christian Bale, Michael Caine, Gary Oldman, and Morgan Freeman are all a pleasure to watch. (Freeman and Oldman lead the pack, with Freeman providing the too-few moments of levity.) I will offer that ALL the players are saddled with way too many ominous, cryptic monologues. At times, the film is almost tediously Shakespearean in its speechifyin’ – makes you wonder how these characters would, say, order a sandwich…it wouldn’t be quick, that’s for certain. New additions Anne Hathaway as Catwoman, Tom Hardy as Bane, Marion Cotillard as a mysterious investor, and Joseph Gordon-Levitt as an eager young cop all turn in credible, engaging performances. Much has been written about Hardy’s Sean Connery-meets-Darth Vader vocal delivery, and, I may be in the minority, but I liked his villainous turn a great deal, almost as much as I liked Heather Ledger’s Joker. The difference being that Hardy had, in reality, the harder row to hoe, saddled with that godawful mask, and conveying a great deal of anger and angst through only his eyes and physicality. I found Hathaway’s Catwoman a slinky, sly, snarky delight – the film brightens a bit every time she is on-screen. Gordon-Levitt, for once, is not doing his winky, dimpled, charming thing but gives a deep-feeling, humane grounding to the often over-the-top proceedings. Yes, the film, like so many comic book adaptations, wraps up with a save-the-world-nuclear-doomsday scenario. That bit is beyond tired. Yet, I found fascinating the villains’ “Tale of Two Cities” plans (until that point) to foment a people’s revolution in the midst of an increasingly self-absorbed, detached society. At times, the film falls under the weight of its own lofty pretensions, and a bit more fun here and there couldn’t have hurt it. All in all, it is well worth seeing and should be applauded for trying to say something a bit deeper and more profound. These are messages we as a society are well past needing to learn – whether or not a movie of this ilk will accomplish that as we continue to skid off the rails is, as I said earlier, impossible to predict.